I also saw one chap on youtube who leaves his knapped flint to soak in water for quite a while before he does the finishing on it. I've never baked flint, though I've tried the soaking in water trick. The theory is that part of the make up of the stone is water and the nodules if they are out of the chalk has had a chance to dry out, thus making it more brittle and soaking puts some of this natural water content back. In practice I found that it made little noticable difference to the knapping of the flint although it did help with keeping the dust down a bit. Another beaker dagger! this one I'm much happier with. The flint was better quality and I was able to go much thinner, so not as "chubby" as the last one I posted! And the other side of the flint beaker dagger. Slightly more on the grey side, as this was closer to the center of the tabular nodule of flint. i can only dream of producing an item like that. I'm fresh out of flint at the moment, I've been picking up cruddy pieces this week but they have fallen to pieces as soon as they're struck. But when I get some quality flint I will do some before and after shots. [img] [/img]This was from a tabular piece of flint with a seam running down the centre, a wierd effect when flaked to shape! [img] [/img]This is one of the few things I have put a handle on, Flint knife from local flint, antler handle and a bone cap on the end to cover over the honeycomb centre of the handle, and artificial sinue to bind over the join. I'm ready now if I need to do some authentic scalping! I was showing some arrowheads I had knapped to an archeologist last weekend, and his comment was that he was used to looking at way smaller versions of mine. He brought some with him the next day, and sure enough, all the arrowheads were tiny. Not one was more than a couple of centimetres in length. Made my lot seem seriously clunky. 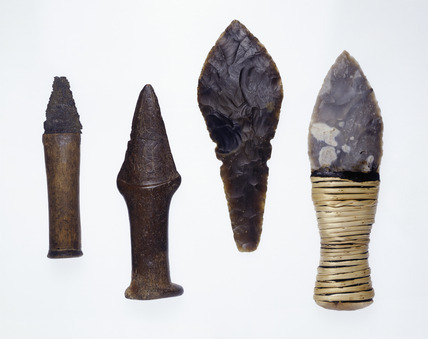 Another thing I found out from him was why chisel arrowheads are the shape they are. He told me that they apparently 'wobble' slightly in flight, causing a larger entrance hole and more damage than an ordinarily arrowhead would. That is a good point, most original arrowheads were quite small. The ones knappers tend to reproduce are not the run of the mill stuff but the eceptional ones often large and more for display or grave goods than shooting. There's a great timeline of American Indian arrowheads here, note the size change in 1300ad when the bow began to be used widely. mr.hertzian cone wrote: [img] [/img]This is one of the few things I have put a handle on, Flint knife from local flint, antler handle and a bone cap on the end to cover over the honeycomb centre of the handle, and artificial sinue to bind over the join. I'm ready now if I need to do some authentic scalping! hey Grendle tats a great timeline very impressed with the programme. aye, the antler handled knife is a beaut! the handle was rather non-authentic in attatchment: I used epoxy to glue it into the slot, and milliputt to fill the gap between handle and blade and the binding is artificial sinue (waxed nylon), it has a certian stretch to it and the wax makes it stick to itself! Still could go into business selling them. This is my latest beaker dagger reconstruction, it is a copy of the flint dagger found with the West Cotton burial in Northampton. Funny curves on this one! Any idea what kind of handles these daggers had? I think I've seen a photo of a replica Phil Harding knapped with a handle, though I don't recall ever seeing a genuine old one with a surviving handle, there are plenty of early bronze age copper daggers with surviving handles though, the corrosion deposits help preservation in the right conditions. I would expect them to be hafted in a similar way with a wooden (or horn) grip in two halves with a slight hollow inside to allow the blade to sit snugly (maybe a touch of pitch pine glue too) and a pommel made of bone to help tie the two halves together, as well as some binding through the notches and around the top part of the handle. Some Mayan Daggers are quite close in shape to these beaker daggers, but have really complex and anthopomorphic grips. Hmmm. I found this picture on the Museum of London website. This seems a bit more primitive handle than the ones from the finds you describe. Are those original handles, or replicas?